So, you’ve had this idea. It’s creative, it’s something you’re passionate about, and it’s a concept your colleagues have said holds potential to be a real business. Thousands of dollars and countless sleepless nights later, you’ve done it. You signed up with a shared web host, installed WordPress, generated content, and followed a strategic marketing and first-year growth plan. Your online business now sees upward of 50,000 customers each month, and you’re the beneficiary of all the revenue that traffic brings in. Congrats! This is an exciting time. As is the case with anything else, website maturity comes with greater responsibilities. All those visitors have high expectations for your site’s functionality and availability, and you can’t afford to disappoint (assuming you want to continue enjoying that transaction-centered traffic). When it’s time to migrate from shared hosting to a VPS, HostGator is excellent for reliable server hosting. If your website starts showing signs it’s outgrown shared hosting, such as slowed performance or excessive downtime, or if you’ve received exceeded bandwidth error messages from your host, it may be time to consider a VPS. A quick Google search will tell you HostGator is an excellent choice. HostGator is known for its reliability as a company that confidently ushers website owners through the ranks of shared, VPS, and dedicated hosting options as their businesses and websites grow. In the past, we’ve praised the hosting provider for providing top-of-the-line customer care throughout the site’s hosting lifecycle. Not only is the HostGator brand a well-reputed and recognized name in the hosting industry, but the company is also backed by hosting giant Endurance International Group. This means mega support resources and a ton of in-house expertise for HostGator customers. You can expect all the VPS essentials to be covered in HostGator plans — custom configurations; hosting for unlimited domains, subdomains, and email accounts; and dedicated resources without the cost of a dedicated server. HostGator VPS packages are not teeming with data transfer and storage resources, but you can trust you won’t pay for more than you need. Of course, you can seamlessly scale up and down as demands fluctuate. With virtual server plans starting at $29.95 a month, HostGator VPS pricing is competitive, and you can easily upgrade as your computing and storage demands scale. Customers get the choice of two or four cores with 2GB, 4GB, or 8GB of RAM and two IP addresses. HostGator provides scalable VPS options to meet virtually any size budget. The bandwidth and storage allowances are somewhat modest compared with competitor plans, but most professional projects and tech startups will probably find HostGator VPS services to be cost-effective, especially if you’re migrating from shared server hosting. HostGator server performance remains competitive with its sister hosts Bluehost, iPage, and FatCow. Its Utah- and Texas-based datacenter facilities are lined with Intel servers, feature a fully redundant network with HVAC units, and are equipped with backup generators to ensure interruption-free performance for your site(s). HostGator would get more points in this category if the company were to add solid-state drives (SSDs), instant provisioning, application-specific caching, performance monitoring or speed boost optimizations. 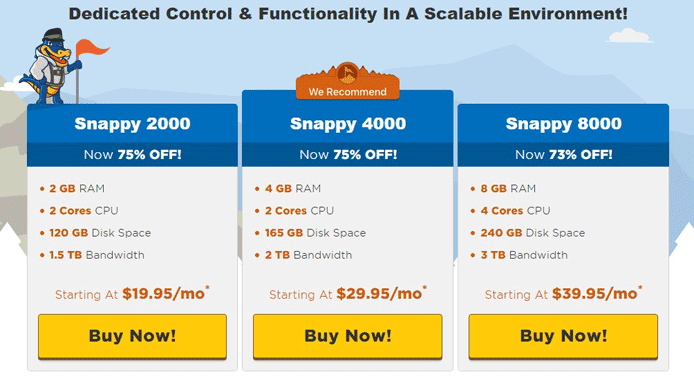 These features have become standard among speed-savvy hosting providers (a great example being the current trend toward SSD hosting), and HostGator is a little behind by not at least offering them as an upsell option. HostGator covers the reliability bases with state-of-the-art hardware, an attentive support team, and weekly off-site data backups, giving customers the utmost confidence in HostGator services. Whether you’re coming from another host or upgrading from one of HostGator’s shared hosting plans, the team offers free migration assistance, and the award-winning support staff is available 24 hours a day, seven days a week, 365 days a year. The 99.9% uptime guarantee is pretty standard across the industry, although up/downtime rates and uptime guarantees should not be treated as the sole measure of a host’s reliability. Nevertheless, you can expect to benefit from a redundant network with no single point of failure. HostGator partners with multiple bandwidth providers and equips its datacenters with backup power generators and Intel processors for maximum performance and protection for your precious server data. How Do HostGator’s Virtual Servers Compare with Those of Competitors? Your website and business maturing to VPS needs is an exciting milestone in your company timeline. It’s an accomplishment to be proud of but one that can be daunting to navigate. For that reason, we encourage hosting customers to partner with a web host that’s known for easing the burden of such transitions. HostGator makes the VPS upgrade a painless one by offering free migration assistance for cPanel users — and our visitors enjoy 30% off the first month of HostGator VPS hosting. It couldn’t be easier to get started, and this is really just the beginning for you and your business idea you’ve poured so much into. The scaling potential is infinite with server hosts like HostGator. Best of luck to you and your (hopefully) million-dollar idea(s)!